The popular guide to dive sites along the Dorset Coast ‘Dive Dorset’  has a site under the name ‘Hartburn’ in which it describes a large iron steamship and asks for feedback as to cargo to help identify the site correctly. The cargo is coal and the Hartburn was carrying railway trucks, therefore not correctly identified. 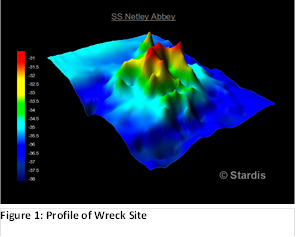 Following a trail of original documents and testing theories by targeting dives to specific features on the shipwreck draw the conclusion that the correct name is the SS Netley Abbey. The site is that of a large iron steamship situated four miles SSW (202.5°) of St Alban’s Head on the Dorset coast. The wreck lies in nearly 40 meters in a tidal area with currents that can reach 4-knots. The size, depth and wreck position in a strong tidal current limited the diving possibilities for the group, therefore, eliminating any thought of establishing base points and conducting a detail survey. A plan of Netley Abbey is retained within the collection of surveys lodged with Lloyds of London for insurance purposes at the National Maritime Museum, Greenwich. Most of the work to identify the wreck was anticipated to be documentary research, with the intention to verify features and possibly key dimensions by diving. Using either contours or a profile through the wrecksite it was possible to estimate the length of the wreckage to be between 80 and 90 metres; this was subsequently verified by measurement during diving. It was also possible to identify nearby anomalies for future investigation. Initial dives had shown significant structure remaining around the bow, and both the boilers and engine stood well clear of the seabed. A Site Plan was produced showing the layout of the key features of the site in relation to each other in preference to a fully detailed survey from established datum points that would have been difficult to achieve. In addition to the general observations, a number of key measurements were made to aid the elimination process in the historical research. The wreck is heavily listed to starboard with the bows to the north, lying 30° - 210°. The bow and stern being more than 45° from the vertical and the port boiler is approximately 30-50cm higher from the sea bed than the starboard boiler. In the middle of the site there is an obvious list in the deck to starboard although this is not as pronounced as at the bow and stern because the deck has settled down. Four large winches are located on the starboard side of the wreckage and a smaller winch, also on the starboard side, is close to the bow section. There are two admiralty pattern anchors at the starboard side of the bow; one being much larger than the other. By the larger of the two is a chain hawser, still with chain running through it. Two large boilers stand 5 to 6 metres off the seabed and a smaller donkey boiler is located close by. Deadeyes for the standing rigging can be found in various locations suggesting a steamer with masts and some auxiliary sails. Mast steps in the deck were subsequently located and measured. A 2 cylinder compound engine lies to the stern of the boilers and dimensions have been confirmed by additional diving. The engine is still connected to the drive shaft that continues through a broken drive tunnel before disappearing under various plates and wreckage. The stern of the wreck is very broken and we have not located the propeller, it is assumed to be either buried or salvaged. These were slightly smaller in diameter than those for SS Hartley and approximately 2 feet too long. The engines of the vessels were subsequently identified as different configurations. This information eliminated SS Hartley from the investigations. The length of the wreckage was measured bow to stern. It was known that this was between 80 and 90 metres from the sounder survey. The bow provides a very clear end however the stern has collapsed substantially making it difficult to determine a distinct end point. Efforts were made to keep the line taut and straight minimising any error from the vertical rise above the wreck. Given a rise of approximately 5-metres over the boilers, the estimated error in length would still be less than 1-metre. The measured length of the wreck was 84.9 metres. SS Netley Abbey was 260 feet (79.2 metres) agreeing closely with the wrecksite. SS Ohio was 241 feet (73.4 metres); the original ship is considered unlikely to be over 10 metres shorter than the measured wreckage, helping to eliminate SS Ohio from the investigation. Engine dimensions were estimated from measurements made on the seabed. It was obviously not possible to measure internal cylinder diameters hence external measurements were taken from the cylinder heads. To simplify underwater measurements of diameter, circumference was measured allowing an external diameter to be calculated. These compare favourable with the stated internal dimensions for SS Netley Abbey of high-pressure cylinder 3 ft 3" diameter and low-pressure cylinder of 5 ft 4" diameter. The crank of the engine was estimated to be approximately 1 ft 8". The stroke of SS Netley Abbey engine is stated as 36”, considering the measurement difficulties this is considered within the measurement accuracy. Mast steps in the deck between the holds had been located and recorded during earlier dives. The Lloyd’s survey report provided mast diameters of 26” and the internal diameter of these was measured to be 2 ft 2 ". A plan of Netley Abbey is retained within the collection of surveys lodged with Lloyds of London for insurance purposes at the National Maritime Museum, Greenwich. A full detailed archaeological survey of the wreck would be a significant task given the depth (38 metres) and general tidal conditions in the area; hence this has not been undertaken. 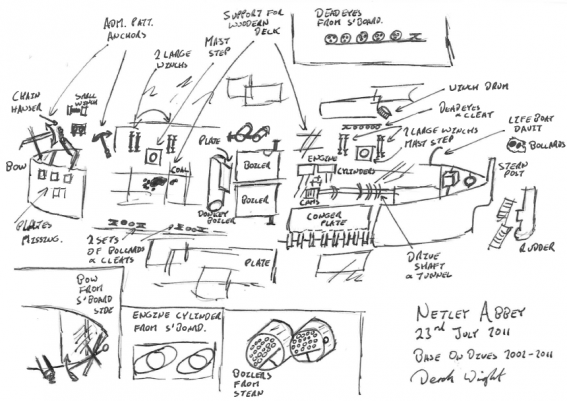 A series of dives have confirmed the general layout of the wreck is consistent with the layout and features of Netley Abbey including the number and position of the masts, the cargo, boilers, engine and position of davits and deadeyes for rigging. 1. J. and V. Hinchcliffe, Dive Dorset, 3rd ed., (Teddington, 1999).